I read the words again. My online reader lets me click a word and do a search in the concordance – so I did. Christ died so that I might live, so how could I do anything to “possess” my soul? I do nothing because He did it all. That was my mind set for too long. Christ did all the heavy lifting and I was expected to live in all that He provided with joyful exuberance. I said the right things. I read the right books. I even attended the right classes. The last several months, patience has continued to haunt my studies. More research showed me that patience was not just sitting around waiting. It is a hope the pushes me to have CHEERFUL endurance and constancy. That requires more effort than just sitting around waiting. My part is to keep doing what I have been led to do – with cheerful endurance and constancy. Christ did His part and the gift sits there waiting for me. I have to do my part to live boldly in the abundance of that gift. 1. Have a sense of humor. The moment I started writing this article, every child in my house needed me. The bacon smoked up the house. The eggs (that my middle son was cooking) required the guidance of a more seasoned cook . . . me. 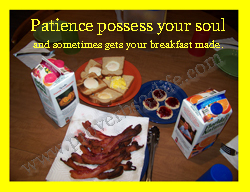 I had to laugh that even writing an article about patience required me to practice patience. 2. It is not just waiting. Although patience often involves some form of waiting, there are still things that have to be done while waiting. Even a pregnant woman does not get to sit around for nine months just waiting. She has to do change how she does things. She has to adjust how she eats. There are actions that are taken even in the waiting. 3. Keep the right focus. In the end it all comes back to Christ. If I am looking to Him for my directions – even the directions that say with – then I will find the cheerful endurance and constancy to follow. Develop your patience. Through your patience you will discover that you can face it all. Thank you so much for stopping by Michele. I love the guitar in your songs – and your words are very touching. You are a beautiful woman with a beautiful message. May you and your ministry be blessed! So the fear of God inspires patience. And what comes of being patient? By your patience possess your souls. There are two options here. Either we possess our souls by our patience, or our souls get possessed by the spirit of impatience. And that spirit leads to other things that can possess our souls.